Let me describe the process. A person – let’s call her Susan – shows up to a hospital, either through the waiting room, via EMS, or perhaps via inter-hospital transfer (if she was already an inpatient elsewhere). If Susan gets her care regularly at this hospital and its affiliated outpatient clinics, then she is in luck – the hospital at least has relatively current records of her past medical and surgical history, her medications, and her allergies. However, if Susan gets her care at multiple hospitals or different clinics that don’t operate under the same system, then she must either be able to explain her past medical history verbally and list her current medications, have printed records and summaries in hand from other hospital encounters, or provide consent for records to be obtained from the outside system(s). Depending on the acuity and severity of her illness (which may affect her ability to participate in this part of the transition of care), the speed at which records are provided or obtained, and the quality of those records, the primary medical team taking care of Susan may be left to piece together a coherent medical story from disparate and incomplete sources. Fast forward now to the day of discharge. The medical team puts together a summary of the hospital course and a list of the medications that Susan should resume taking, stop taking, or modify how she takes them. This information is saved in the hospital’s medical record, and is available for access by her outpatient primary physician (though it often must be faxed or mailed, which is not usually done proactively), by Susan herself, and by hospitals that request it in the future (with Susan’s permission). The problem here is that information gets splintered. Unless Susan or someone advocating on her behalf ensures that all of her data and records get where they need to be, then she runs the risk of encountering health providers who have outdated information – and who (hopefully) realize that their information is outdated before they act upon it. There is no centralized source of continuously current information, and the onus is placed on Susan to keep all of her health providers on the same page. Depending on Susan’s own socioeconomic status, level of education, health literacy, and other factors, this may be a gargantuan task. 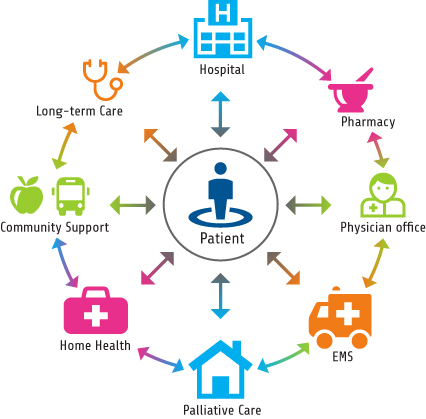 As the healthcare landscape changes and we learn more about what works and what doesn’t, we will have to place extra emphasis on transitions of care in order to create a culture of health between the hospital and home setting – and in order to distribute the burden across the system, instead of putting the sole responsibility on the individual, like in Susan’s case. The Institute for Healthcare Improvement and the Joint Commission have written extensively on this topic, and there have been multiple articles and policy briefs, such as this post on Health Affairs in 2012 discussing the way that the Affordable Care Act would try to address some of these systemic issues. Ultimately, the success of these changes will depend on our ability to emphasize the importance of care transitions at each level of care. This will require an ongoing investment of time, money, and manpower in order to make this work. I believe that with the continued evolution and interconnectedness of our electronic health records, and with the incentives built into the Affordable Care Act towards quality improvement, we will be able to reach this goal. Great read. I absolutely love the idea of EHRs; and I cannot wait to see the impact it will have on the future healthcare (or in this case, the improvement of health post hospitalization). Yes! Totally agree. We are just in the initiation phase now; we haven’t seen the full potential yet of EHRs. Great infographic too. Thanks for pointing out this issue! I am in medical school, and have never realized how this could cause problems, but now I’ll definitely pay attention! I’m a family physician. I always tell my patients being admitted to hospital is a sign of failure. Any representation of doctors in the media is always a bunch of surgeons in scrubs gathered round the operating table. But a patient only comes to that when their primary care doctor has failed to keep them well. There’s never a picture of some doctor’s office with some dowdy doctor in his grimy white coat or dog-tooth tweed jacket “in the trenches” – who are the real heroes. What an interesting post! I’ve just recently come across your blog and can’t stop reading. I like how informative your posts – and how completely relevant! I just started a blog named Dear South African Doctors which I like to think targets similar issues. Maybe you’d be interested.